After all, it is “just an animal, right? I must say that recently my understanding of the love pet owners have for their friend has grown immensely. Being a very meticulous and compulsive person in many ways I have lived alone most of my life. I like things a certain way and am very particular about how things are done. It has been a nuisance to some degree living this way and has caused difficulties in numerous relationships. At 44 years old now, I have never been married, have no children, and my parents and closest family members have mostly passed on. Living alone and being alone most of the time has really started to bother me. For the past few years, I have been attempting to be an animal lover and have tried 2 kittens, a very complex saltwater reef aquarium, and a girlfriend with a chihuahua. I am definitely not a cat guy, lol, loved the aquarium but was a full-time job, and the girlfriend didn’t make it due to my OCD tendencies. So I sat back and waited for a pet to come to me when the time was right. A few weeks ago a friend (Janice) I hadn’t spoken to for almost 10 years posted on Facebook trying to find a loving home for a ‘lil pup. A few people responded and I gave it a quick thought but then figured it looked like a pit bull and why would someone be giving away a puppy if there wasn’t a problem with it. That was that, I just forgot about it. Two weeks ago, out of the blue Janice contacted me after hearing about me talking of getting a dog from a mutual friend. I said I don’t know, what breed is it? How old? Long or short hair, male or female? Gave the puppy the complete rundown before ever giving it a chance or seeing it. So I said I’d let her know all the while never planning on it. For some reason, one day I got back to her and told her I’d take him and he would be loved no matter what kind of dog he was. Janice was so happy and excited it made me laugh. I instantly got frustrated with myself and regretted my decision on taking the dog. I thought of every possible worse case scenario that could come to mind and had anxiety for the next two days over this mutt coming to my house. All I could think of is it stinking up my house and being a nuisance. When Coby arrived it was love at first sight. This puppy has changed me in so many ways I can’t explain. My entire outlook has changed and it is all due to my little friend and his companionship. He is a God sent gift that has brought a meaning to life and how it can be shared in harmony. He is such a good boy and a true miracle in so many ways! God bless all the happy pet owners out there, I understand exactly how you feel! Numerous kidney conditions affect different areas of the organ. Most conditions do not impact the whole kidney and its structure. Instead, most disorders stem from problems with the renal artery and renal vein (the blood vessels to and from the kidney), tissues within the kidney, or the ureter, which is responsible for transferring urine from the kidney to the bladder. Kidney disorders are unique in that their symptoms are very similar, if not the same. Here, we discuss the seven most common symptoms of kidney disorder. Urine odor can vary from person-to-person. Much of this has to do with someone’s diet, level of hydration, physical activity level, or the temperature in their environment. If a malfunction of the kidney is present, it’s common for urine to give off either a fishy or sweet smell. A change in urine odor can also occur from diabetes, liver disease, and even certain supplements. In a healthy person, urine will have a pale yellow hue. Those who drink a lot of water may have lighter-colored or clear urine, both of which are also normal. Dehydration may produce a dark yellow color, which in itself is not necessarily dangerous, but should serve as a reminder to drink more fluids. Urine that is brown, black, orange, pink or red is abnormal and could signal an underlying disorder or disease. Blood in the urine (hematuria) produces red to pink-colored urine – and should prompt us to visit a doctor to rule out a serious condition. Urine is composed of approximately 95 percent water. The other 5 percent are a mix of minerals, metabolized drugs, and other substances. The high concentration of water usually produces clear to dark yellow urine depending on hydration levels. When there are visible changes, such are the presence of pus or froth in urine; it is necessary to have a check up. Excess protein in the urine may also signify a problem, but it isn’t always visible. Pus or froth in the urine may be the result of an underlying infection. As the kidneys are situated in the abdominal cavity, wherein many other organs lie, it can be difficult to pinpoint the source of pain without a doctor’s help. However, kidney pain tends to be located around the edges of the abdomen and the back. A burning sensation while urinating, despite popular belief, is usually not a kidney problem. Instead, it’s more likely to be a urinary tract infection, or UTI. Of course, a UTI necessitates medical intervention and treatment. Kidney problems can produce an excess or shortage of urine expelled. A condition called oliguria will cause a person to produce less than normal amount of urine. Polyuria is when a person expels more than 100 ounces of water in a day. Again, water intake has a lot to do this. But sudden changes in urine frequency without altering fluid intake may be a cause for concern. Swelling, especially of the legs, may surface as the kidneys cannot expel the normal amounts of urine. This condition is more broadly described as “water retention.” Shortness of breath may occur as the blood’s pH levels are erratic – this places more burden on the respiratory system. Nausea (an incredibly broad symptom) may surface as byproducts accumulate in the blood stream. 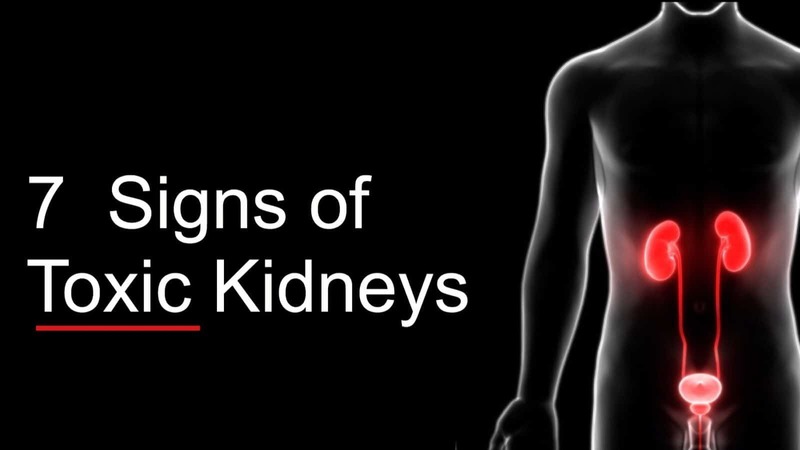 The kidney, as with many other vital organs, can produce seemingly unrelated symptoms. Some symptoms reported by medical professionals upon the diagnosis of a kidney condition include confusion, headaches, fatigue, muscle cramps, seizure, and skin discoloration. It is also important to mention that certain racial and ethnic groups are at a higher risk for kidney failure than others. Compared to Caucasians, the rate for African-Americans is nearly 4 times higher; Native Americans and Hispanics, 1.5 times higher, and Asians at 1.4 times higher. Reducing stress whenever possible is the best preventative measure you can take; not just for preventing kidney disease, but nearly every other adverse health condition. Urinary strip tests may be purchased at certain pharmacies. Self-screening is a good idea to rule out the more severe kidney conditions, but it is still advisable to seek a professional opinion. Treatment depends on whether the condition is acute (short-term) or chronic. An acute kidney condition may be due to many things, and a doctor must order tests to determine the appropriate treatment. Provided treatment is properly administered, the recovery rate is high. Chronic kidney conditions generally require a dialysis or kidney transplant. Again, the earlier that the condition is discovered, the better. It is important to have a comprehensive physical done every year. If you should identify with any of the above-mentioned symptoms, please seek the advice of a medical professional. Hold on to your hat, as changes are on the way. Your life in August – and possibly September, too – will be very busy and likely to be memorable. Eclipses change the status quo, shake us up, and take us out of our comfort zone. It is through adapting to change and moving forward that we grow and mature. Life is for the courageous, and you will see this to be true as you gain experience. If you should feel you don’t like the changes that come up, you will be able to make changes later. Keep an open mind – an eclipse can take several weeks, and sometimes several months – before its message is clearly delivered. For that reason, don’t say any certain eclipse was good or bad; the universe needs time to show you its plan. The way things play out might be better than anything you could have imagined, for the first eclipse, August 7 in Aquarius 15 degrees, will hit the very pinnacle point of your chart – your tenth house of honors, awards, and achievement. This suggests exciting professional recognition is on the way to you. A full moon brings a culmination to events, so the work you’ve been doing in your career, possibly going back a decade or more, will be rewarded and known by many in your industry or the world at this time. Sometimes the reward comes naturally, without too much effort. In that case, you might get a promotion or an offer for an exciting new job. Sometimes the universe has to figure out a way to get you out of your current career position so that you can find a new position that would use your talents more fully. In that case, you might be forced to leave, at no fault of your own, and then have to look for that new position. If this is how it works out for you, look with confidence. Later you will say that they did you a favor. Here is why I feel that way. Jupiter, the good fortune planet, is currently moving through your workaday sector (sixth house), indicating you’ve been working on a number of special projects that have come to the attention of VIPs. They clearly are impressed with your work, and clients are pleased to, and subsequently, these influential people have put you on the short list of stars that show great potential. Now it’s time for your reward. Or, it may be, say, you are a director, have finished shooting a major movie, and now it’s finished and about to be released – I feel you will garner much acclaim. If you are self-employed, you know by now that you get new clients, and for any reason, lose a client, a shift seems to be underway, but none so much as to worry you. I should mention that no matter if you are self-employed or work for others, this month you might get an award or excellent publicity. If you do, it will change everything – your outlook, your prospects, your plans, and your own view of yourself – for this is the aim of an eclipse. The universe will find a way to give you reward in one way or another, so keep your eyes open and stay optimistic. It’s also possible that a top-level woman (lunar eclipses point to women) might announce a departure from the company and that change in the hierarchy could create an opportunity for you. The month’s second eclipse, August 21 in Leo, 29 degrees, will focus on your home and property, or possibly your family. You may be relocating to accommodate the new job or move now that you can raise your standard of living due to the better pay you will be making. Or, it may be that you need to make an important repair or renovation on your home, and that may have nothing to do with your career. This eclipse is a new moon, which opens a window of opportunity when none existed before. Eclipses tend to bring sudden news, so be ready. You may move, switch roommates (or have none at all, thereby doubling your space), paint rooms, or undertake a number of changes to your home to make it cheerful and a cozier place to be. You might buy or rent a new property, such as a vacation home, for example. If you have been trying to think of a way to assist one of your parents, the new moon solar eclipse of August 21 can help you find the ideal solution, for your parents are covered by the same fourth house. This August 21 eclipse will receive a shimmering beam from Uranus, bringing surprise news, and from Saturn, increasing your sense of security. No matter how many ways you look at the facets of this eclipse, it should be favorable or have very favorable parts or outcome. A golden triangle of enormous harmony will appear in the heavens linking the eclipse: Sun (new moon plus Mars cuddled in your house of home), to Uranus (surprising, sudden help), and the third part of the triangle, to Saturn (currently in your financial house of other people’s money). If you need funding, there is a good chance you will get precisely the amount of money you need, such as from a home improvement loan or mortgage, as two examples, of funds that you might need. If your parents are in good health, one parent might be very sympathetic to your needs and give you a financial gift or loan to help you get started. Saturn has been in your eighth house of other people’s money for nearly forever (I overstate – it’s only been two-and-a-half years, but it might FEEL tough taskmaster Saturn has been in your financial house forever). You may have been saving up for a house, but found the many sacrifices you had to do difficult. Now it seems that you will have the chance to finally buy that house, or if you are more mature, finally pay off your house completely. Yet I feel even enforced changes will work to your benefit. If you are not ready to do either of these things, then be cheered in knowing Saturn will leave your financial house of other people’s money on December 20 of this year and not return until 2044. You won’t have to wait long to see results – the August 7 full moon lunar eclipse will have a major effect on your career. It will bring attention to all you’ve done, and to the promise of what you will achieve in the future. To get a better clue of what the eclipse might bring, you might want to think back nineteen years, to August 8, 1998, when you last had a similar eclipse to the one you will have August 7, 2017. Those two eclipses are in the same sign of Aquarius and both at 15 degrees. Also look back to August 22, 1998, same month, when you have the same solar eclipse at the same 29-degree and sign of Leo. You might pick up a theme. If you have a birthday that falls on or very close to May 6, you might feel changes in your career, but you will benefit from the changes. You like things to remain steady, as your Taurus Sun teaches you to be consistent. If you have a birthday that falls on or close to May 19, opportunities arising regarding your home or family may get you moving. If you were not born near either date, you will feel them equally but not likely strenuously. On my website online, AstrologyZone.com, I have a table of eclipses going back to 1994 and forward to 2030 so you can see which dates stand out for you. No eclipse will ever repeat exactly because each one is individual. The other planets change position continually and that matters. Look on the website at the Learn Astrology link for that list of all the eclipses. Also below the table of eclipses is an essay I wrote, “How to Deal with Eclipses.” That article is also on the premium version of my paid app, called Susan Miller’s Astrology Zone Daily Horoscope. (The app is available on Apple App Store and Google Play.) On the app, look under Life + Love, then go to Susan’s Essays to find the piece I wrote on how to best deal with eclipses. Or, see it instantly on my website’s homepage online. The table of eclipse dates is only found on my website homepage lower left side, but not on my premium app. This is an exciting month, Taurus. You won’t have to wait long to see results – the August 7 full moon lunar eclipse will have a major effect on your career. It will bring attention to all you’ve done, and to the promise of what you will achieve in the future. A woman may announce a departure, creating surprise among the staff, but the vacancy will create an opportunity for you, too. The August 7 lunar eclipse is remarkably friendly. This full moon will be showered with lovely beams from Jupiter, giver of gifts and luck, from your house of work projects, indicating a plum job may come up that allows you to prove your worth. Apparently, your reputation precedes you, and as a result of your work on this and assignments are done earlier, you will be in line for praise and possible promotion or an offer from a competitive company. If you are self-employed, you are likely to pick up a lucrative new client. Several industries shine now: The Internet, digital world, telecommunications, the space sciences, charities, a not-for-profit company, or social work or the humanities – you will do especially well, as this full moon is in Aquarius, ruling these areas. The full moon always brings news to culmination – you will hear soon. The second eclipse of August 21 will be a new moon solar eclipse in Leo and focus you on your home. Solar eclipses are known to open a new path, so if you hoped to renovate your kitchen, redo your closets, make home repairs, find a new roommate (or see one leave, thereby doubling your space), you will get your moment. You can buy a house or condo, or sell one. You may move residences to take advantage of career opportunities or upgrade your living situation due to the fine things happening in your career. Or, if you are getting serious about the one you love, it may be time to move in together. With a solar eclipse happening this month, someone may be “eclipsed out” of your home environment, such as a roommate, or you may see your landlord or superintendent change. Mars, the action planet, will be in your home sector all month, giving extra emphasis to this part of your chart. Mars brings noise and movement – you may move, yes, or you may simply invite guests to stay over in your guest room, or give a party. Keep in mind that events that happen at eclipse time always fall outside the norm – eclipses are powerful and can bring on the major life altering events, in this case, most likely happy ones. Mars will work with Jupiter on August 20 – felt for many days before and after – another fortunate coincidence, suggesting that you will move into a new home, or make your current home more spacious, sunnier, or beautiful. Jupiter is now in your sixth house, indicating that you might be setting up a home office or exercise room (as the sixth house would cover both areas, or either one). Romance will not take center stage, not unless you are moving in together, or one of you is moving out (either is possible). If your birthday falls near May 5, you will feel the first eclipse, August 7, with changes in your career most directly. If your birthday falls near May 19, you will feel this eclipse strongly. It is rare to see an eclipse as positive as the one August 21. All solar eclipses, like this one, are new moons, known to open a previously locked door. This solar eclipse will also create a triangle in the sky, linking Saturn (security), Uranus (sudden change), and the Sun and the moon (opportunity). If you need funds such as a mortgage or bank home improvement loan or cash for a down payment from family, you are likely to get it this extraordinary month. Life can’t always be this sweet, but when it is, take full advantage. Eclipses run in families of signs, and the first one in this family occurred six months ago, on the full moon lunar eclipse on February 10. That one emphasized your home and family, just like the one August 21 will do. Any discussions that came up then will be advanced to a new level now at the next eclipse in Leo, August 21. Remember that some eclipses are felt one month to the day earlier or one month to the day later plus or minus five days. This family of eclipses in Leo-Aquarius will keep coming every six months in different degrees of the same two signs until January 2019, at which time you will be fully transformed. You won’t feel all the eclipses in the series of signs, only the ones that touch your natal Sun, moon, or planet in your chart. As we go along I will tell you. More importantly, eclipses repeat every 19 years, so think back to the time near August 8 and August 22 in 1998 to see what came up then, for you may find a theme to be loosely echoed now. Today I was stressing out looking online for ways to keep my house. Working against God’s will. I’ve been praying daily and nightly but still trying to do things my way. Along my searches I ran into a woman realtor in California who posted her number on a forum with hopes to help someone with their foreclosure. I called the number and spoke with her for over an hour. In the end I felt so much better and accepted the outcome. I need to start fresh and everything is pointing to leaving the house and focusing solely on recovery. The woman has been in AA and sober for many years. She has been through my situation and much worse. She is now a success and living a life of God’s will and true happiness. Things don’t happen by chance. We are now friends on Facebook and I’ve volunteered on a hotline to help people in crisis. Prayer is great if you let it work in your life. When a young woman texted DoSomething.org with a heartbreaking cry for help, the organization responded by opening a nationwide Crisis Text Line to provide an outlet for people in pain. Nearly 10 million text messages later, the organization is using the privacy and power of text messaging to help people with issues such as addiction, suicidal thoughts, eating disorders, sexual abuse and more. The data collected in the process is reshaping policy and preparing schools and law enforcement to better handle spikes in crises.